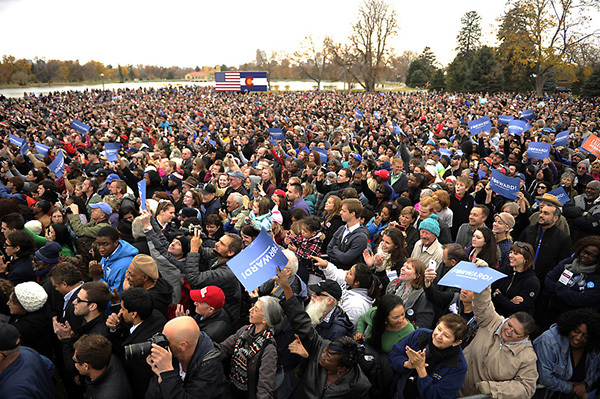 Denver, Colorado-President Barack Obama will holds a rally to an estimated 16,000 at the Meadow in City Park in Denver today, as part of a busy coast-to-coast campaign barnstorm of swing states. 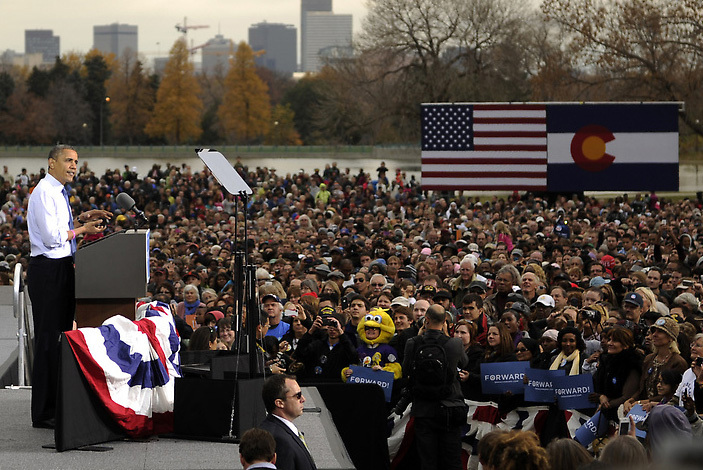 In a In a looming forecast of rain, and snow later in the night, thousands of people gathered into Denver’s City Park for a mid-day rally with President Barack Obama. People danced to a DJ playing dance song covers as they waited for Obama, who is racing through nine swing states in a no-sleep 38-hour stretch 13 days before the election. In presidential campaign’s final two weeks, President Obama continued to criticize Romney for flip-flopping on issues – which he has dubbed “Romnesia” – but returned to a familiar plea for voters to give him the time he needs to finish his goals. “We haven’t finished everything that we want to get done,” he said. “That’s why I’m running for a second term. But every single day that I set foot in the Oval Office, I’m fighting for your families. And with your help, I’ve kept many of the major commitments that we made.” Said President Obama. Romney has an edge in national rankings, according to a compilation of surveys by the website RealClearPolitics, though Obama continues to lead in some battleground states, including Ohio, New Hampshire and Iowa. Besides Denver, President Obama will rally in Iowa and Nevada on Wednesday in hopes of swaying those few, but critical, undecided voters in important swing states.